Voice over Internet Protocol , because this is the full form is nothing more than technology that transmits voice (and not only) over the Internet. You probably do not know yet, but traditional telephone networks will be switched off in the near future and will be completely replaced by VoIP (2020-2025). VoIP primarily allows communication between people. The connection takes place bypassing traditional terrestrial transmitters using Internet connections based on the IP protocol (hence the common name “Internet telephony”). What significantly affects the costs of calls and functionalities offered within the VoIP services – the costs of maintaining this type of infrastructure are definitely lower, thanks to which VoIP providers offer “more for less”. The VoIP technology uses the RTP protocol ( Real-time Transport Protocol ) for data transmission, which transmits information in real time, allowing for two-way exchange of messages by users without unnecessary delays. The RTP protocol itself is not enough to be able to provide the right quality of service (QoS: Quality of Service ), therefore the SIP protocol is often used to establish the connection ( Session Initiaion Protocol ) – currently the dominant signaling protocol for VoIP , which effectively displaces the very popular protocol H.323 . Why do I write about it and why is it worth to get interested in this topic? First of all, VoIP is currently available virtually anywhere and for everyone. Most people say that VoIP is quite expensive equipment and complicated service. 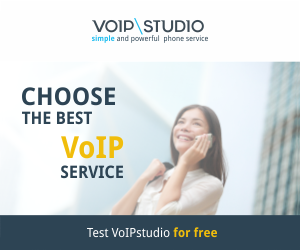 The truth is that it takes just a few minutes to start using VoIP. Of course, a lot depends on the provider that we choose because the quality of offered services is very important. In order to be able to make the first connection using internet telephony, we do not need any specialized equipment or a dedicated IP phone – all you need is a computer with an internet connection on which you install the appropriate software (Softphone) or Smartphone equipped with: Android system – I’m going to write a separate article about such configuration (using Android Phone as IP Phone). VoIP is not something new (the beginnings date back to 2004), and the users’ awareness of the availability of such solutions is relatively small – in Poland only a few percent of users use it and are aware of many advantages of such solutions (compared to e.g. fixed-line telephones that some users are still attached to). Although new technologies make life easier for us, people often approach them very carefully. Therefore, it is worth realizing the benefits of using Voice over Internet Protocol in everyday communication. First of all, using VoIP technology allows you to avoid the charges imposed by cellular networks. Very often, the delivery of such services does not require long-term contracts and offers a range of flexible packages (e.g. Pay As You Go package). It gives more freedom in communication, and also allows you to keep your privacy – we do not have to provide many sensitive data that are required by mobile networks. Another advantage is undoubtedly very low call costs, both for landline and mobile phones, at home and abroad. A few pennies for mobile calls to almost any country in the world are extremely competitive rates. Including, of course, free calls within the operator’s network (internal calls). The user does not have to worry about roaming, only internet access is required. Lower call costs and flexible calling plans are just one of the many benefits that VoIP offers us. Do you know that thanks to VoIP telephony services, we have the opportunity to purchase a phone number in almost any country around the world? What’s more, with a few clicks from the configuration panel, we can receive and make outgoing calls from the number e.g. in Great Britain or France without moving from home. In addition to standard functionalities such as Voicemail, call waiting, queues, conference rooms or a number of settings for transferring calls to various parts of the world, you can easily configure your own IVRa ( Interactive Voice Response ), e.g. set up interactive response for incoming calls so that, for example, clicks on appropriate buttons forward calls to other numbers or save a message. VoIP is mostly a synonym for great possibilities. The Internet is becoming more and more available every year, the number of users using the Internet is growing very fast, and VoIP is currently one of the most dynamically developing telecommunications services. I highly recommend and encourage you to learn more about the possibilities offered by Internet telephony.